It is used to effect TV signal transmission in the frequency range of 2500...2700 MHz with a further shifting of TV channels with the help of a down-converter into the frequency range of 662...862 MHz to view these channels using a standard TV transmitter - an alternative to a cable TV. A 600 mW output power for a chennel while having a receiving antenna with 14 dB gain and a transmitting antenna with a 10 dB gain results in getting a coverege area radius of more than 25 km. (MMDS signal shaping is effected by converting of each UHF signal into a correspondent section of the MMDS range and amplification of the converted signal and a further summing of converted signals with the help of filters). MMDS group transmitters (MMDS-DG/L, MMDS-AG, MMDS-DG, MMDS-DG/B) convert the whole section of the UHF range (not in a channel way) into the frequecies of 2500...2700 MHz with a futher amplification of a group signal. A low-power MITRIS system is intended for channel "shifting" from the main head-end to new locations for a distance of several kilometres. It is impossible to use digital tuners in the nwe locations because signal reception is conducted by analog tuners from a low-power MITRIS system. The price of this system can be compared to the price of digital tuners. FTV-300 and FTV-300/S videosenders can be used to transfer AV-signals of one TV program. They shape frequency modulated signal in the range of the 1st satellite IF (950-1200 MHz) which is intended for reception by a satellite receiver. 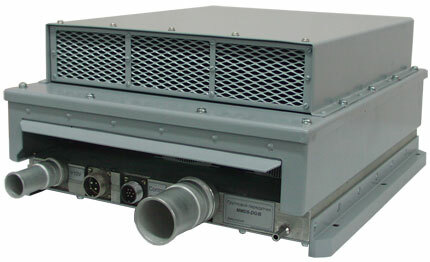 The FTV-300/S enables transmission of 2 sound subcarriers. Output signal band of these transmitters amounts to 30 MHz, the maximum output level amounts to 4 W. While using a TA-300 directional antenna with a 14 dB gain and the SWR <1,5, a 14 dB protection ratio transmission distance amounts to not less than 10 km (with a 14 dB store above sensitivity level of a transmitter) in light-of-sight conditions on a 1000 MHz frequency with a 64 dBm sensitivity of a satellite tuner. FM-transmitting equipment comprises FST-410 models with a 10 W output power which can perform a function of a signal shaper for FST-420 (100 W), FST-427 (500 W), FST-430 (1000 W) high-power transmitters. The transmitters are supplied with an TA-101/3 antenna with vertical polarization.